Our locations - KRASS e.V. Because we want our programs and projects to benefit as many people as possible we are eager to spread our vision and increase our impact in all regions of the world. In order to make this happen we rely on the support of locals and local institutions. Feel free to get to know our Social Franchising concept, KRASS on site, established for local, independent organizations or individuals. KRASS on site includes certain essential quality standards, nevertheless, you are given the freedom to carry out our vision independently. Our previously tested projects and programs can easily be adapted to local conditions. 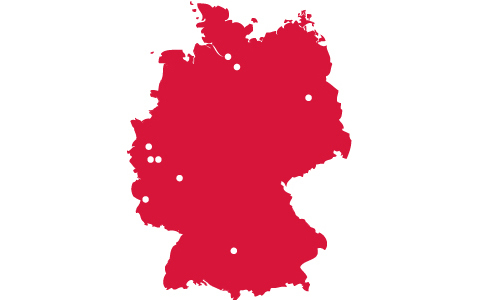 You can find more information about our KRASS on site locations here. Get to know artists, educators and professionals from all over Germany. Benefit from our brand name KRASS when communicating with public institutions and sponsors. Browse our helpful manual full of tips and tricks and valuable experiences. Accounting Rely on our advice and support. We will help you with any flyers, text modules or social media. We introduce you to the concept: KRASS on site. You have eight weeks to calmly convince yourself of KRASS on site. Next there will be a founding meeting with two of our members during which all questions regarding finance, networking and target group reachability are resolved. After signing the contract you will get a personalized handbook that considers your specific conditions and a one-day training. An opening ceremony with important guests from your region will be held. Also, further questions will be answered. What is especially important for us Our quality standards for KRASS on site (KvO) are vital components of our organization, KRASS e.V..
On site groups offer socially deprived children and teenagers access to art, media and culture projects and programs. KRASS on site leaders by contract commit to certain standards in the pedagogical area. This ensures ongoing high quality of our projects and programs following our vision and guarantees that these are rightfully performed in the name of KRASS. Furthermore, KRASS on site leaders are supported by the association at all times and profit from the extensive KRASS network. Are you interested in founding a KRASS on site group? If so, please write us an e-mail: info@krass-ev.de. We are excited to meet you!